My main character in WoW has been an Alliance paladin since the game launched. My buddy who signed up with me didn't want to play "the bad guys" of the Horde and I capitulated, but I always had a soft spot in my heart for those crazy orcs and trolls. 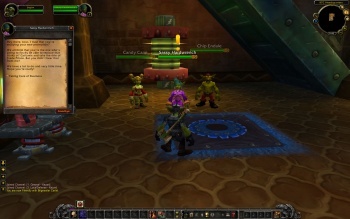 The Horde always seemed like they were more fun and had the more interesting questlines. So when I found out that the goblins would be a playable race in Cataclysm, added to the fact that my buddy no longer plays and my alliance characters were feeling stale, I decided to roll Horde when the expansion dropped. 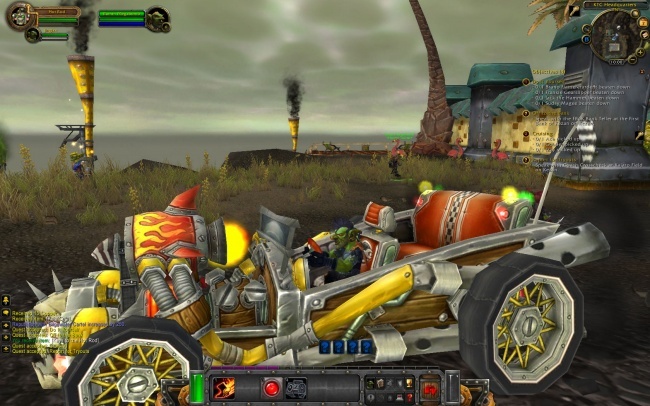 I was also interested to see how Blizzard would present the heavily steampunk-influenced goblins. Unlike other fans, I have no problem with WoW pushing the boundaries with what usually constitutes high fantasy. The "spacegoats" of the Draenei and the technologic anachronisms amuse me. I was happy to find that the goblin starting zone doesn't shy from the race's affinity with explosives and superior technology. No matter what type of character you create, you spawn on the tropical island of Kezan and play the role of a rising corporate star in the Bilgewater trade cartel. Kezan is a bustling metropolis, complete with bright billboards hawking Kaja'Cola, a series of paved highways and a professional footbomb team, The Bilgewater Buccaneers. As an executive in the cartel, you have a staff which also doubles as your questgivers. Of note is Sassy Hardwrench, your long-suffering executive assistant, and Megs Dreadshedder, the marketing whiz who gives you keys to the company hot-rod ... you know, to keep up the corporate image. From the quest text, you can infer that your character is gunning for the position of Trade Prince, which is currently held by a rich goblin named Gallywix. There's a party planned in honor of your recent promotion (for which you have to prepare by buying a pimping outfit picked out by your bimbo girlfriend, Candy Cane), but Gallywix tries to sabotage it by hiring some South Sea pirates to attack the festivities. Appearing astride a mechanical walker, Gallywix says that all of this political maneuvering is pointless, not because he suddenly had a change of heart, but because Mt. Kajaro is erupting and every goblin on the island must evacuate or burn to death from the liquid hot magma.